So, uh, yeah…that awkward intro after the previous article I wrote was a pre-emptive obituary for the New York Rangers playoff run. Things have certainly changed in the Rangers-Pittsburgh Penguins Eastern Conference Semifinal series since last Thursday. The Blueshirts have gone from a team that looked lost on the ice to playing how a hockey team should perform in the playoffs. After making Penguins Goalie Marc-Andre Fleury look like a Vezina candidate in Games 2 and 3, they’re back to making him look like the slightly-above average goalie that he is. A few things have changed for the Rangers over the past few days, and the Blueshirts are now one victory away from going to their second Eastern Conference Finals in three years. 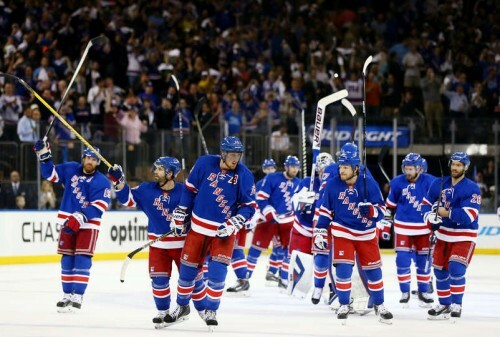 The first change to make a big difference for the Rangers was snapping their 0 for 36 power play streak in Game 5. When Chris Kreider opened the scoring midway through the first period, it got that monkey off of the teams back. As much as players try and tune out all of the talk in the media when a particular aspect isn’t going well, they’re acutely aware of whatever the deficiency may be. Sure, they went 0 for 6 with the man advantage in Game 6, but going 2 for 3 on the power play in Game 5 halted the focus on their power play woes. The second major difference is how the Rangers are getting goals. First of all, they’re actually getting goals. Secondly, all three Game Six goals (Martin St. Louis, Carl Hagelin, Derick Brassard), and the second and third Ranger goals in Game Five (both Brassard) came from the slot or right outside of it. The Ryan McDonagh power play goal to make it 4-1 Game 5 was partially due to Benoit Pouliot creating a screen in front of Fleury. The Rangers are getting down low in the zone, creating traffic and confusion in the crease, and are paying the price to score goals. It doesn’t matter if it’s Fleury or Vladislav Tretiak in net: when you make things difficult for a netminder right in front of the crease, pucks will go in sooner or later. After spending the early part of this series trying to score from the outer areas of the Penguins zone, the Rangers are playing blue collar hockey, and it’s been paying off. Derick Brassard has been the Rangers best offensive producer in their second round series against Pittsburgh. Two pillars in this series for the Blueshirts have been Henrik Lundqvist and their third line. Lundqvist’s only bad game was Game Four (4-2 loss), and he didn’t get any goal support in Games 2 and 3 (both shutouts). Say what you want about Lundqvist’s post-season numbers, but when the chips are down, he keeps them in it. The goal he gave up in Game 5 was due to a great individual effort by Evgeni Malkin, and the lone goal he gave up in Game 6 deflected off his own player. As for the third line, they’ve been the only unit consistently producing in this series. Derick Brassard’s four playoff goals have all come against Pittsburgh, Pouliot scored the OT winner in Game 1, and at least one member of that line has scored in every game that the Rangers have found the net thus far. Brassard, Pouliot and Mats Zuccarello are currently second, third, and fourth in Rangers playoff scoring. While the top six forwards have been mostly quiet in this series, the third line has done their part. With six games in the rear-view mirror, it all boils down to a seventh game at Consol Energy Center tonight. If you’re on the Rangers side of the fence, you have to feel good heading in to Pittsburgh. The momentum is on your side, and the strong play of Lundqvist and the third line have already been discussed. The fourth line has done its job of making life difficult for the opposition, and the second line seems to have gotten a boost from the return of Kreider. The first line is lacking in production (Rick Nash is still goalless with only five assists in this playoff campaign), but if the Marty St. Louis goal in Game 6 ends up being a spark to get the offense going, watch-out. Martin St. Louis scores the first goal of the game in Game 6. As for Pittsburgh, we haven’t seen a game where they dominate and play Penguins hockey yet. The top-heavy unit of Sidney Crosby, Evgeni Malkin, Chris Kunitz, Kris Letang, and Paul Martin could wake up at any moment. The Rangers must stay out of the box, and they’ll need Lundqvist to be the King (4-1 career record in game sevens). The team that has scored first has won every game, and that’s important for more than the obvious reason. With the exception of Game 1 (when Pittsburgh battled back to tie the game), the first-scoring team dictated the pace of the rest of the game. As for the chippiness that has been prevalent throughout the series, I wouldn’t expect too much of that. Sure, there will be a little chirping and shoving in goalmouth scrums, but nobody wants to be the guy in the box when the other team scores on the power play. The battle to advance to the Eastern Conference Finals to face the winner of Boston–Montreal kicks off at 7PM on NBCSN in the United States and CBC in Canada.